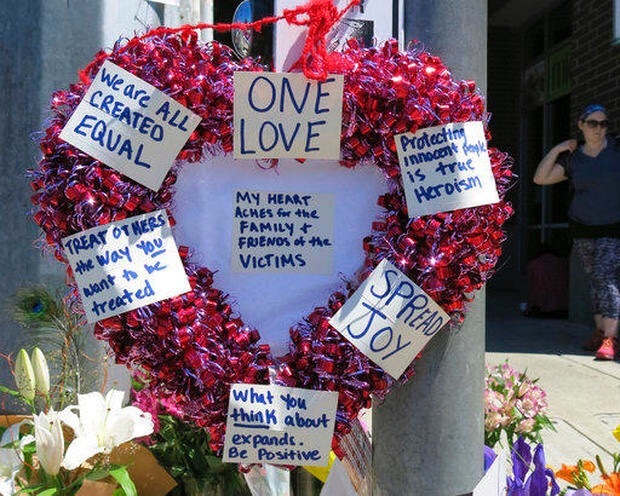 A few days before the tragic train stabbing in Portland, I wrote a story about people who stand up to hate, and choose to love one another regardless of the color of your skin, what religion you follow, what language you speak and who you choose to love. This horrible act of violence by a white man, who slashed out at three men defending some young Muslim teenagers on a commuter train, has shocked the nation and I felt compelled to write about it. This was a senseless act of violence that cut down the lives of two men, valiant and honorable heros who stood up to this vile and hateful American with only one thing on his mind, pure hate for these Muslim girls. Taliesin Myrddin Namkai Meche, a recent college graduate with a degree in economics was one of these men. Meche’s final words were, “Tell everybody on the train that I love them.” Even in death he chose to love people, with no thought of himself. His mother said she had raised him to love everyone and that’s what we all need to be doing right now. A kind bystander, covered him with his shirt and told him he was a beautiful man, and that he was so sorry that the world is so cruel. And it’s getting worse everyday, following the hate filled campaign trail last year that filled our heads with racism and judgement and lack of love and respect for others. The second victim, Rick Best, was an Army veteran, a husband and a father of a 12 year old daughter. He was a city of Portland employee who was described as someone who always stood up for people and was always willing to help someone in need. A third victim, Micah David-Cole Fletcher, is recovering from his injuries with no insurance to cover his medical expenses. A Go Fund Me account has been established for the three victims at GoFundMe.com, Tri-Met-Heroes. The attacker, a nazi loving white supremist, Jeremy Joseph Christian, is a 35 year old man who was born right here in the United States, not from one of the President’s banned countries. He spewed racially hateful garbage against the Muslim girls, attacking them while yelling about their race and religion, telling them to go back to Saudi Arabia and to “get out of his country.” As the girls tried to run to the back of the train to survive, the three men tried to reason with Christian, who started slashing them, with blood quickly filling the train. I am sincerely heartbroken about the horrible deaths of two men and and injured another, who died defending the rights of these young girls, the very rights that founded our nation. The freedom to practice their own religion, that we are all equal, the pursuit of happiness, not hate and to be free in America. These men believed what I do, that you should be tolerant of others, to love and embrace their differences and to stand up to hate of any kind. I would like to pose a question to you readers as a follow up to my article, Love Trumps Hate. What do you believe causes someone to hate? How they were raised by their family? Experiences they had as a child or young adult? People they hung around with? The media? Our government representatives? I thank you in advance for responding so that I can share this information with all of you. Go out today and do one random act of kindness for someone different than you, and be sure and contribute to the Go Fund Me account.